So the messy fallout of two civil wars (or two halves of the same civil war, if you prefer) is behind us, and now we come to probably the most important of the Umayyad caliphs, ʿAbd al-Malik b. Marwan, who took the throne after the death of his father in 685. ʿAbd al-Malik spent the first ~7 years of his reign finishing off the challenge posed by Ibn al-Zubayr in Arabia, although it would be more accurate to say that he spent the first 7 years of his reign letting his chief military commander, al-Hajjaj b. Yusuf (d. 714), finish Ibn al-Zubayr off. Al-Hajjaj was ʿAbd al-Malik’s alter-ego for much of his reign, and there’s a strong case to be made that his caliphate would have gone much differently, or not gone at all, if he hadn’t seen something in al-Hajjaj and made full use of whatever it was. But more on al-Hajjaj later. Although we alluded to this last time, it bears repeating that ʿAbd al-Malik was crowned “caliph” in name only, because in 685 the dominant political figure in the empire was easily Ibn al-Zubayr. He controlled virtually the whole empire outside of the Umayyad core in Syria and also Egypt, which had only recently come back into the Umayyad fold and was not fully under ʿAbd al-Malik’s control yet, either. Ibn al-Zubayr also had an excellent case to make in support of his caliphate: he was one of the last living Companions (sahabah in Arabic), or those who had known Muhammad personally while he was alive; he stood opposed to the Umayyad push toward dynastic rule; and maybe most important of all, he controlled Mecca and Medina. If one of these guys was the ruler and the other the rebel, then the facts on the ground suggested that ʿAbd al-Malik, despite having assumed his father’s claim to the caliphate, was the rebel. Complicating things further, another high-status Umayyad named Amr b. Saʿid seems to have decided that he should have succeeded Marwan, and in 689 he rebelled, while ʿAbd al-Malik was away from Damascus on campaign. We’re told that ʿAbd al-Malik abandoned the campaign, returned to Damascus, had Amr arrested, and then personally executed him. It’s at this point that al-Hajjaj figures into the story in a big way, so let’s pause for a minute and talk about him. It’s difficult to say much about imperial figures other than the caliphs in the Umayyad period, especially because no Umayyad-era chronicles have survived (if any were even written). The later historians (and by “later” I mean a century and a half or more, which is nothing to sneeze at) who wrote about the Umayyad period and whose writings are the earliest record we have of, well, anything that happened from Muhammad through the 9th century, really, were too far removed and too dismissive of the Umayyads (we’ll get to that) to give us an accurate picture of many of the personalities that must have run the empire, and anyway these were court historians who knew very well that their writings should focus on and glorify caliphs, not bureaucrats, because caliphs were the ones doling out the patronage money (and the prison time if you really ticked them off). But Al-Hajjjaj is the exception. A seemingly brilliant military commander, maybe the best the Arabs had found since Khalid b. al-Walid, he eventually rose to become the more-or-less autonomous governor of the eastern half of the empire. In this he resembled someone like Agrippa, the loyal lieutenant of the ruler whose abilities were so great that he ascended to a rank almost co-equal to his patron and probably could have risen higher if he’d been so inclined. Al-Hajjaj was legitimately plucked out of obscurity by ʿAbd al-Malik, who noticed his aptitude for command when he briefly served in the shurtah (a word that can mean “police” but in the period we’re talking about means “internal security”) and was able to calm a budding mutiny in the army. ʿAbd al-Malik put him in charge of a small contingent of Syrians that was able to penetrate Arabia and bottle Ibn al-Zubayr up in Mecca, at which point ʿAbd al-Malik sent reinforcements that allowed al-Hajjaj to besiege the city and ultimately defeat Ibn al-Zubayr. Al-Hajjaj was appointed governor of Iraq, and his political and military acumen enabled him to pacify what was undoubtedly the most difficult province of the empire for the Umayyads to control. He performed so well (and so brutally at times; he was particularly harsh in dealing with non-Arab converts and with the Iraqi soldiers who had supported Ali, Husayn, and al-Mukhtar against the Umayyads) in his role that he was rewarded with additional territories to conquer and govern in the Iranian east, eventually coming to govern that entire half of the empire, and implemented ʿAbd al-Malik’s administrative reforms there (he ordered that Arabic replace Persian as the language of the bureaucracy, for example). He also earned increasing levels of autonomy, particularly after ʿAbd al-Malik died and was succeeded by his son, al-Walid I (d. 715). But we’re getting ahead of ourselves. Once the war was over and ʿAbd al-Malik was established as the undisputed caliph, he set about two tasks: rebuilding the empire that had begun to fray during the long period of instability it had just experienced, and instituting a complete bureaucratic overhaul that would transform the caliphate from a collection of cities and regions into a centrally-run empire. Under the first caliphs and the Sufyanids (the Umayyad rulers prior to Marwan), the caliphate was ruled centrally but administered locally; it was divided into regions, each ruled nominally by the local Arab military elite, but that military elite had almost no involvement in the actual operations of governance. They were cordoned off from the local population, living in newly built garrison cities (amsar), and delegated authority over those local populations to more or less the same local bureaucrats who had held those positions under the previous (Roman and Persian) empires. The currency was unchanged (though Ibn al-Zubayr had begun to mint his own coins), local laws and procedures remained in place, and even the language of governance was unchanged (Greek in the Levant, Coptic in Egypt, Aramaic or Persian in the former Persian lands). The Arabs governed themselves through the same informal tribal arrangements that had always characterized Arab society, and interfered little in the lives of their new subjects aside from ensuring that tribute was collected. This kind of system worked well enough when the person on top, the caliph, was a capable ruler who appointed capable governors and maintained oversight of the system. But it was a recipe for disintegration when that wasn’t the case, as the two civil wars amply demonstrated. ʿAbd al-Malik changed all of that, created a real empire instead of a loose association of provinces, and in doing so made himself arguably the most consequential figure to ever hold the office of caliph. He drew heavily on the example of the empires that the Arabs had just conquered even as he took apart the regional and local bureaucratic structures that were the last remnants of those empires. We’ll start with his military reforms, which led directly into his army’s success on the battlefield. To this point, the Arab-Muslim armies had been essentially levies, and local chieftains were expected to produce their soldiers when needed. That system worked fine when it was one Arabian city fighting another Arabian city, but the preceding 30 years had shown that, in the context of a vast empire, it was a recipe for rebellion. So ʿAbd al-Malik professionalized the army, building on Umar’s diwan to create a registry of all fighters, who were then paid an annual salary along with a monthly stipend. This new army organization once again brought Iraq and Arabia securely under Damascus’ control, and allowed the Arabs to break the submissive treaty that Muʿawiyah had been forced to sign with the Byzantines. In the long run, this new military organization would create problems for the caliphate by exacerbating social divisions and factionalization. For one thing, it gave preference to Arabs over non-Arabs, alienating the majority of the empire’s conquered population, and to Syrian Arabs over other Arabs, and the armies of Syrian Arabs that were sent to garrison other parts of the empire started to look like occupying forces after a while. For another, the deliberate move away from tribalism as the basis of military organization actually had the effect of increasing the attraction of new factional alliances and disputes, specifically the Qays-Yaman rivalry that factored into the Second Fitna. Both of these factors would play significant roles in the eventual downfall of the Umayyad Dynasty. ʿAbd al-Malik made similar centralizing changes to imperial administration. Up until his reign it’s fair, though oversimplified, to say that the Arabs had left the administration of their empire to the people and institutions that had been administering it for the Romans and Persians. Local laws and regulations remained in force, local bureaucrats continued to collect taxes and manage their cities and towns, local languages served as languages of administration. Part of this was due to simple expedience and the fact that the Arabs as a people had no experience ruling an empire. But in the short term, for a rapidly expanding empire, it also made a lot of sense. The Arabs and their armies needed taxes to keep being paid and day-to-day business to keep being done day-to-day. And since they were very much a minority ruling class, they needed to make the changeover from empire to caliphate as non-intrusive as possible for their new subjects. In the long run, though, all of this had to be standardized, or else the caliphate would have pretty quickly fallen apart. Bureaucrats, accountable to the caliph, replaced tribal chieftains or local notables as chief administrators, and a vast network of riders functioned as both postal system and spy network, reporting back to the caliph on the actions of his governors. The established system of piecemeal localized taxation, which was then kicked upstairs to the Arab rulers as tribute, was replaced with a uniform system of taxation throughout the empire. Arabic replaced local languages as the language of administration. As taxation replaced tribute, the empire’s finances stabilized, and there also came to be a clear distinction between the Arab rulers and the non-Arab ruled. New taxes were imposed on subject populations, taxes that were ostensibly intended to apply to non-Muslims (that is, those who weren’t fully on board with Muhammad’s mission; “Muslim” is still a hard term to define at this point) but that, in practice, applied to non-Arabs. At this point, it was probably better from a tax and social status standpoint to be an Arab who was still Christian or Jewish than it was to be a non-Arab who had accepted Muhammad’s message, reflecting some uncertainty about whether this empire’s identity was going to be based on religion or on ethnicity. In fact, “conversion” to “Islam,” whatever those things meant at this point, was discouraged for non-Arabs, presumably because it would either reduce their tax burden or cause resentment among the new converts (when their tax burden wasn’t reduced, as it never was, despite the fact that they’d converted). ʿAbd al-Malik’s currency reform is named, in many sources, as the proximate cause in the breaking of that treaty with the Byzantines and the resumption of hostilities. 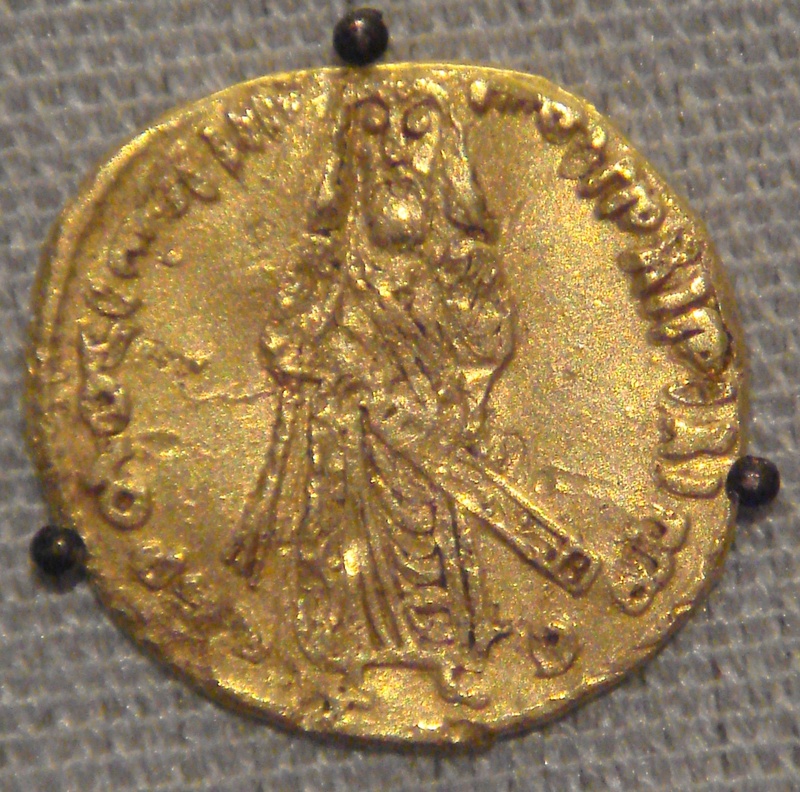 Supposedly, Emperor Justinian II (d. 711) objected to ʿAbd al-Malik paying the caliphate’s annual tribute with these coins, either for religious reasons (Justinian II had introduced the image of Christ to Byzantine coinage, which the Arabs, naturally, changed in their own coins) or because the coins themselves may have been slightly lighter than the gold Byzantine solidus upon which they were patterned. The latter reason in particular seems unlikely, because the Arab tribute would presumably have been paid by weight and not by number of coins, and really it’s likely that both men were itching for a reason to break the treaty and the coinage was just a convenient excuse (different sources make this claim about one or the other man, but I suspect both were keen to get back to fighting one another because subsequent events happened so quickly that it seems like they had both been preparing for it). The result was the 692 Battle of Sebastopolis (in Cilicia), during which a potential Byzantine victory was snatched away when most of the imperial army’s Slav soldiers defected over to the Arabs in the middle of the fight. Now, Byzantine historians would have had every reason to blame a major defeat like this on some kind of betrayal whether it was true or not, but these Slavs had only recently been forcibly transplanted by Justinian II from the Balkans to Anatolia, so it’s not too hard to imagine there were some resentments there. Those resentments, perhaps combined with a bribe from the Arabs, would have been more than enough to get a large number of the Slavs to switch sides. The battle ended with a tactical Arab victory, but the caliphal army was too spent to follow up. 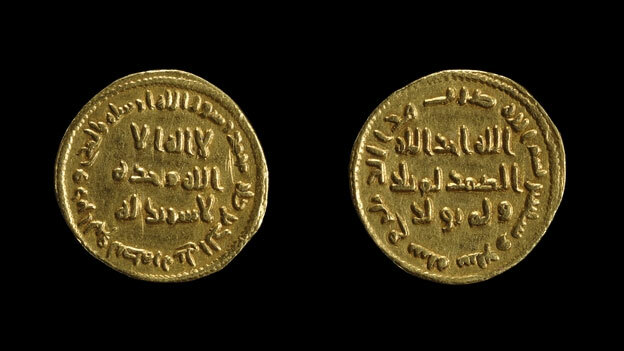 The empire’s most dramatic currency reform came later, in the mid-690s, when ʿAbd al-Malik adopted a new coin that completely tossed out historical precedent and did away with images altogether, replacing them with textual slogans including the shahadah (“There is no god but God, and Muhammad his His messenger”), and a variation of the shahadah that includes the line “and He has no partner.” These became the model for Islamic coinage moving forward. The implication of these radically different coins is that sovereignty, something that coinage has always expressed, lies not with the caliph/emperor, but with God and Islam. The other implication of the new coins is that ʿAbd al-Malik was making a break with the Roman/Byzantine/Christian past and establishing something completely new, and this brings us to the religious elements of his reign. This is the one piece of ʿAbd al-Malik’s reign for which we have some contemporary evidence (recall that no Umayyad-era texts have survived), because we can rely on his coinage, some surviving contemporary poetry, and his building projects in the Hijaz and in Jerusalem. They don’t tell us much about ʿAbd al-Malik’s reign or his religious beliefs, but they do give us some information as to how ʿAbd al-Malik wanted his reign to be seen and the path he wanted the emerging Islam to take. Later sources claim that he studied Islamic law extensively until he was expert in it, and he used that great expertise to judge disputes and issue dogma. Whether he actually studied the law or not is up for debate, but there is no question that he, as Caliph, had a much greater role in setting dogma and religious practice than later caliphs would enjoy. The stories about his extensive studies may have been invented by later scholars to explain and excuse the fact that a caliph used to be so involved in matters of religious law and belief, when by the time the histories were being written those things were the province of the scholars alone. ʿAbd al-Malik undertook considerable development work in the Hijaz, completely rebuilding the Mosque of the Prophet (in Medina) and the Kaaba (which had been damaged during al-Hajjaj’s siege of Mecca), and he built the Dome of the Rock on the Temple Mount in Jerusalem, on the site where Muhammad is said to have risen into Heaven during his Night Journey. 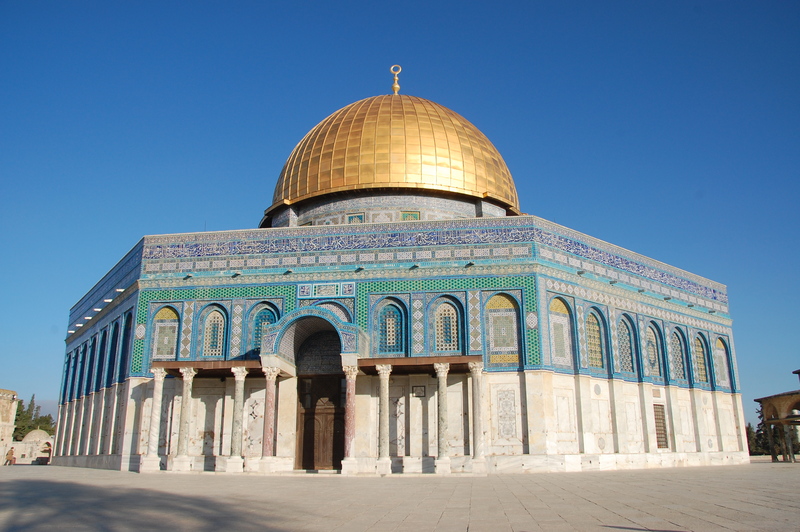 The reason for the construction of the Dome of the Rock is still kind of a mystery to the present day; at the time it was built (finished in 691), it’s even possible that ʿAbd al-Malik intended it as an alternative pilgrimage site to the Masjid al-Haram in Mecca, which was still outside his control. It’s actually not completely certain that Mecca was the center of Islam at this point; we still know very little for certain about what “Islam” looked like at the end of the seventh century, and it’s possible that Jerusalem was as or even more important to the emerging faith than Mecca was at this point. Speaking of Islam’s formative period, ʿAbd al-Malik also seems to have been instrumental in the transition of Islam from a relatively ecumenical movement (one in which, say, Christians could be full participants) into an exclusive religion of its own, because the inscriptions he had done inside the Dome of the Rock are some of the earliest statements about “Islam” that are known to exist, and they’re written in response to Christian dogma. The inscriptions, some Qurʾanic in origin, explicitly reject the divinity of Jesus or the idea that God had a child–here we see, again, the phrase “He [God] has no partner,” which was also inscribed on ʿAbd al-Malik’s coinage, as well as phrases like “He did not beget” and “He was not begotten.” Frankly, we don’t even really know what the Qurʾan actually looked like at this point either, and there are hints in later sources that ʿAbd al-Malik ordered a revision of whatever written text existed at the time, which may also have been about differentiating early Islam from Christianity. Islam was distancing itself from its fellow Abrahamic monotheisms, or at least ʿAbd al-Malik was doing so on its behalf. Another change was in title, where ʿAbd al-Malik took the title “Caliph of God” rather than “Caliph of the Messenger of God.” This was a change that had actually been made by Uthman, but in all the turmoil from Uthman through Marwan it hadn’t really mattered. However, it reflected a fundamental rethinking of the office of Caliph; instead of being the successor of Muhammad, bound in key respects to continue what Muhammad had set forth, now the Caliph was the deputy of God Himself, the same title that the Byzantine Emperors took for themselves and one that suggested much wider latitude to interpret the law and establish religious practice. He also took the epithet “Shadow of God on Earth,” which would be part of Caliphal titulature for centuries to come and has the same connotation of Caliph as God’s direct representative to mankind. This change in title may have partly been motivated by circumstance; this was a period when small rebellions were constantly cropping up in one part of the empire or another (in part driven by the new, more draconian tax laws), and virtually every rebel leader was appealing to his would-be followers on religious grounds, each claiming to represent God somehow. ʿAbd al-Malik needed to speak the same language in defense of his right to rule. ʿAbd al-Malik’s efforts were intended primarily to shore up his own rule and ensure that his heirs would succeed him peacefully and keep the empire intact, but at the same time they were meant to (and did) transform the caliphate into a real empire, rather than a loose patchwork of provinces under a single ruler. The empire had become too big, and the population too large, for the system established by Umar (the Arab military caste living under one set of rules while the general population lived under another) to work, and so it was inevitable that either the Arabs would be assimilated into the various local cultures of the empire or that those local cultures would be subordinated to Arab culture. ʿAbd al-Malik ensured that it would be the latter. He both Arabized the empire, by enshrining Arabic as the language of governance and Arabs as the ruling class, and Islamicized it, by formalizing the new faith and establishing it as the basis of his political authority. By the time he died in 705, his empire was peaceful, stable (his son, al-Walid I, succeeded him with relatively no controversy), and once again on offense against the Byzantines in North Africa and Anatolia, and against the various Iranian and Turkic peoples it encountered to the east. The Umayyad Dynasty looked to be in complete control of the new empire, but in reality their time in power was already running out. We can pick up the pace a little next time, so we’ll go through the next five caliphs and the next 40 or so years, which was the Umayyad heyday and will bring us up to (SPOILER) their overthrow. I’m repeating myself, but studying the Umayyads is difficult in large part due to the fact that the earliest surviving written histories were written by the dynasty that overthrew them, and so they have a tendency to paint the Umayyads in the worst possible light. That’s why there’s very little about the Umayyads out there. GR Hawting’s The First Dynasty of Islam is still the first and last word on the Umayyads, for the most part. Chase Robinson has written a biography of ʿAbd al-Malik for the “Makers of the Muslim World” series, published by OneWorld, and I relied pretty heavily on it in putting this together. Hugh Kennedy’s The Prophet and the Age of the Caliphates, 600–1050 and his The Armies of the Caliphs: military and society in the early Islamic State. Patricia Crone’s God’s Rule – Government and Islam: Six Centuries of Medieval Islamic Political Thought and her God’s Caliph: Religious Authority in the First Centuries of Islam (with Martin Hinds).